[CHG] Steamless is now a UI based application using C# WPF. [CHG] Steamless is now written in an extendable format using plugins for unpackers. Included in the Steamless v3 package is the ExamplePlugin source code. 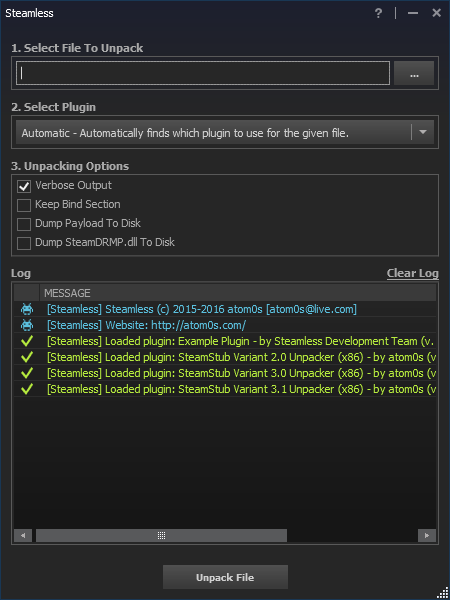 You can use this plugin base to create your own unpackers for Steamless. Plugins should reference Steamless.API.dll to obtain access to the needed classes and structures as well as helpers. Plugins should be coded in C# (however Vb.NET should work as well). Initialize: Initialize is used to allow your plugin to prepare itself for usage. This is called when Steamless is first loaded and plugins are being located and initialized. Your plugin must return true in this function if you wish for it to be usable. Returning false will deem it as invalid and not be listed as a usable plugin. CanProcessFile: CanProcessFile is used to determine if your plugin can handle the file being processed. The file path is passed to this function, which your plugin should do whatever it needs to to determine if it can unpack the file.If your plugin is able to handle the file, you should return true, otherwise false to allow another plugin to try to handle the file. ProcessFile: ProcessFile is called when your plugin has been selected to process the current file. The full file path and Steamless options will be passed to your plugin to allow it to handle the file. (You should honor the options selected by the user while unpacking the file.) If your plugin successfully unpacks the file, it should return true, if not, it should return false. got an error when try to run it. It is compiled with the .NET Framework 4.5.2. Be sure that you have that installed. yes. It has been installed, but still the same error. I plan to do 64bit plugins when I have the time. But if you want to do them that's cool. I'm open to others contributing. It says failed to unpack file.